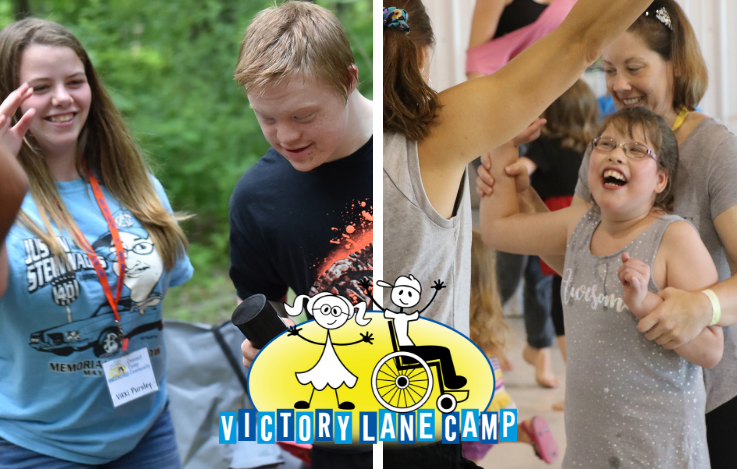 When Victory Mom Amy Muegge first looked at the Victory Lane Camp brochure, her reaction was summed up in one word: “nope.” Reluctant to try to pull the funding together, she wasn’t sure if she could commit to camp for her and her daughters Emma and Hannah. It took some convincing from TIM (teen-in-mission) Jadyn Youngquist, Emma’s school friend, and financial planning for the family to be able to attend a summer camp session in 2017. Amy found the experience to be “better than expected” and even had some time to relax. Amy and her daughters were joined both years by Vikki, who is the daughter of Amy’s boyfriend. During this year’s summer camp experience at Bradford Woods, Amy saw the impact VLC was having on all of them. In particular, she watched as Vikki became close with Cindy and Aaron Cook. “They really made an impact on her. She kind of buddied up with them and helped Cindy out,” Amy noted. “Vikki has decided that she wants to work with special needs kids as an adult.” Amy believes this would not have happened if Vickie hadn’t gotten connected with Victory Lane Camp. Amy was also able to watch her daughter Emma, who has special needs, meet a lot of different kids and participate in a supportive atmosphere. Emma especially loved campfire time. “It was really touching that they made a song just for her one night. Her eyes were just filled with joy and happiness to see Mike [Brown] with his guitar singing to her. He let her play with his guitar too. That was pretty nice,” shared Amy. Amy is thankful for the connections she’s made through her continued attendance and connections with in Victory Lane Camp. She sees the other families and individuals involved as people who understand and care.